Lake County's own Military Funeral Honor Team and a lone "Civil War soldier" stood at attention October 10 during the graveside services at Middletown Cemetery for Lorenzo Theodore Adams. After his service with the Union Army during the Civil War, as one of the Wisconsin Volunteers, Lorenzo Theodore Adams made his way to California and settled in Middletown. The usual military headstone was never placed on his grave after his death in January 1898. The omission was noticed by Judy Kauffman, one of our Gibson members, as she pursued her avocation of photographing gravestones for the Find a Grave website. With the help of her husband Bob, cemetery director Meriel Medrano, Adams' granddaughter Beverly Gibson (now a resident of Montana), and several weeks' effort, the oversight was redressed. Middletown Cemetery received L.T.’s headstone, compliments of the Veterans Administration. This military marker has just been set in the Evergreen section #147, plot 3, next to the marker of Adams' daughter, Mrs. John Francis. An honors ceremony was held October 10. Eighteen other Civil War veterans and one Spanish American War veteran are buried in Middletown Cemetery. In 1889, William Good donated the land for the Middletown Cemetery located at 16357 Butts Canyon Road. He was a blacksmith who had his place of business across from Lobree. He was a brother-in-law of John Reineke, and they both worked in the blacksmith business. The land was once the Reineke Family ranch. A small cemetery was located at the Fiege Ranch. The remains from this small cemetery were transferred to the new Middletown Cemetery owned by the Odd Fellows Lodge. There were also remains transferred from the cemetery at Rabbit Hill. On June 4, 1894, the remains buried within town limits of Middletown were approved for reburial elsewhere. Rabbit Hill was an aviator observation post during World War II. Middletown’s first cemetery was in the flat alongside Rabbit Hill on the east side of where the Standard Oil property was located. There are eighteen Civil War veterans and seventy-three veterans buried here. There is one Confederate soldier, John Reineke, who was born April 12, 1832 in Germany. He died May 9, 1910 in Arroyo Grande, California and his remains were sent to Middletown for burial on May 10, 1910. In 1903, John Good Jr. from the Spanish American War was buried here. Middletown Cemetery District was formed in 1966 to provide and maintain a cemetery. 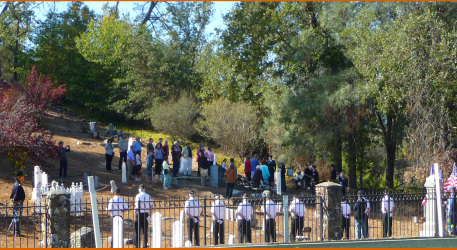 The cemetery is limited in use to the burial of residents or taxpayers of the District and their families. The District is north to Hofacker Lane, South to the Napa County line, East out Butts Canyon Road to the Napa County line and West to the Quonset hut on Highway 175, near Whispering Pines. The District is composed of five Board Members. The original members were Orval Brennen, Paul Mountmarquet, Clarence Morin, Reis Palmer and Roy Vines. All are deceased except Paul Montmarquet. The cemetery’s location is on the southeast corner of Butts Canyon Road and Highway 29. The cemetery originally had 3+ acres. In 1991 they acquired the Catholic Cemetery that added 5+ acres.